Users of Internet Explorer and Firefox browsers may display the current Iranian calendar date on their browser by downloading a small software program on their machine. For instruction, choose your browser. Click on the button below . If the security warning dialog box is displayed, click on Run. Although the publisher (that's me) cannot be verified by Microsoft, you and I know he can be trusted. Restart Internet Explorer to see the toolbar. 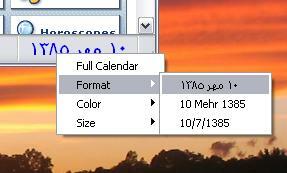 The Iranian Calendar Toolbar shows the current date on the toolbar of Internet Explorer. This software has been tested on Windows Vista, Windows XP, and Windows 2000 only. It may or may not work on other versions of Windows. The date can be displayed in Persian (above), English characters, or numeric (below). In addition to the format, the size of the text can also be changed too. Just right click on the txst for setting these options. Left click displays a full calendar in a separate window. If your popup-blocker blocks the full calendar, you may add http://www.alavi.us to list of popup allowed sites. Rest assured that this site never displays any window not requested by you. If you cannot see the toolbar after installation, you may need to make it active from Internet Explorer menu (View->Toolbars->Iranian Calendar. See below). The toolbar can be moved and resized like any other toolbar on Internet Explorer. Just drag the handle shown inside the red mark below. 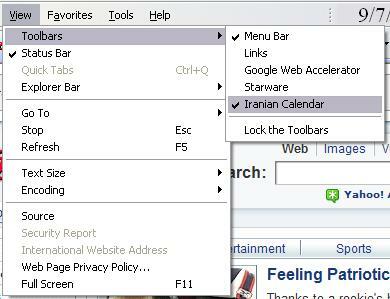 To uninstall , use Add/Remove Programs in Control Panel to remove Iranian Calendar Toolbar. The Iranian Calendar extension for Firefox browser shows the current date in the status bar. The format, color, and size of the text can be changed. Right click on the text to get context menu (below). Left click to display the full calendar in a new window. To install, visit https://addons.mozilla.org/firefox/3420/ and install it. To uninstall , select Tools menu in Firefox. Then select Extension (or Add-ons) and uninstall Iranian Calendar.